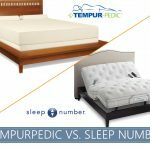 Home » Bedding & Accessories » What’s The Best Mattress Topper (Pad) For Hip Pain In 2019? Are you waking up with an increasing ache in your hip area? Do you feel like your old and too firm mattress is the culprit? If so, you're one of many people who doesn't pay enough attention and fail to recognize the critical importance of the sleeping surface in relation to coxal area discomfort. Inappropriate sleeping positions could cause a lot more harm than hip pain, but this is undoubtedly amongst the most common complaints. Of course, investing in a brand new mattress is a serious investment. Luckily, there is an alternative. What Type is Best for Hip Pain? 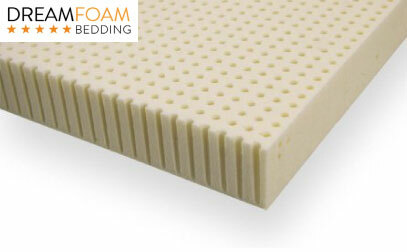 If you're in a hurry check out the Dreamfoam Bedding: This pressure relief topper is made from Talalay latex and bamboo. It provides a gel-like feel which will help you forget painful mornings and wake up fresh. A proper bed pad is a good alternative and can be more than enough for the overall orthopedic condition of your entire body, including your hips and shoulders. We’ve compiled a list of things to account for when purchasing a great mattress pad for your hip pain. We will also review some products which perform well on this issue. So, without any further ado, let’s go right ahead and take a look. There are a lot of things that you ought to account for, but the truth is that the best choice of mattress pad will significantly enhance your hip soreness. This is especially true if you decide to go for a memory foam solution. Plush memory foam is known to provide serious and soft support which will cushion your entire body is nothing short of high-end comfort. When it comes to hip pain as well as to pressure relief, it’s considered to be the best option. Interestingly enough, memory foam was initially invented and developed by NASA to help astronauts to withstand the serious G-forces. Memory foam offers enhanced elasticity which will conform to the contours of your body, providing acute and tailored support throughout the entire length of it. While some people might have concerns regarding the so-called “trapping” effect of memory foam, this is something far outdated and no longer observed with the newest foam technologies, readily available on the market. A gel-infused, 4-inch thick bed pad and it's specifically intended to reduce and alleviate stress off significant pressure points in your joints and muscles. This is a bed pad which is designated to ease a wide range of different ailments. It takes the pressure as well as the stress off your injuries and conditions, and it allows for a perfect night of sleep. The current offer also includes a free cover which will save you a significant amount of money. There is absolutely no need to replace your current mattress as the 4-inches of cooling gel, infused with large and dense memory foam is going to turn it into a convenient sleeping solution. Renowned for its convenient construction, this is a mattress pad which is truly capable of helping you with hip pain at night. It is 2.5 inches thick, and it is made out of 3.5 Pound Visco Elastic memory foam of Cool IQ. 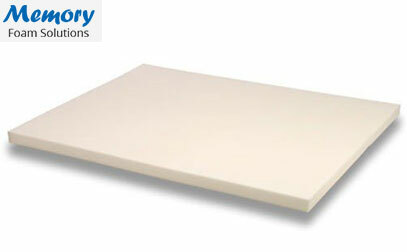 This is a lighter technology which provides the surface of the topper with a larger amount of open memory foam cells. This is going to make the material particularly breathable, and it will increase its airflow additionally. The product is naturally hypoallergenic, and it’s perfect for people with allergies. Additionally, it will thoroughly contour your body, turning any sleeping position into a healthy one. 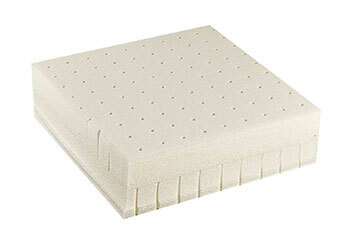 This is a 4-inch topper which is specifically designate to enhance and empower your current bed. The intention is to provide you with a better night’s sleep and to alleviate any stress you might be encountering on your hips. There are a few layers in this bed, with the first one being 0.5 inches thick and it’s essentially a fiber-quilted cover designed to enhance the overall durability. The second layer is 2-inches thick, and it’s made out of convenient memory foam which contours the shape of your body perfectly and, hence, allows for serious pressure relieve on your hips and shoulder. The third layer, however, is the one that’s supposed to make the difference as it’s the pressure relieving comfort foam layer. 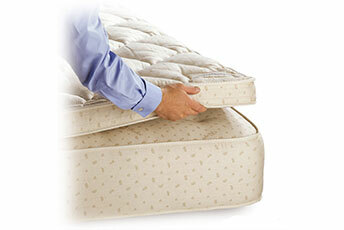 The mattress is built using the highest quality of memory foam which is available. It is certified by CertiPUR-US, and it is tested for content, performance, and durability. The shipping is quite convenient as well as the company uses a patented rolling technology, allowing comprehensive boxing of the product. The warranty is set to 5 years, and it's limited. A great solution if you’re looking for something to quickly rejuvenate your mattress and make the sagging and uncomfortable areas go away. 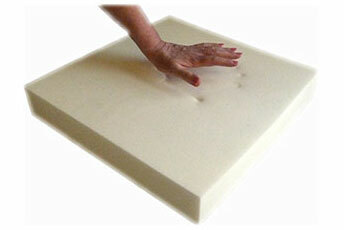 The product consists of one layer which is 3-inches thick and made out of memory foam. The main designation of the product is to contour your body snuggly to accommodate different sleeping positions and to help you alleviate the stress on common pressure points such as your hips and shoulders. Additionally, it brings a gel-like feel at a fraction of the cost which is definitely something to account for. The product is entirely made in the USA and it exceeds the certification standards of PURGreen as it is entirely made out of eco-friendly materials and production processes. As you will find out below, memory foam might just not be the best solution for your needs out there. There are other conventional materials such as bamboo and latex which are incredibly beneficial. A lot of people usually prefers the gel-like feel of latex and the comfort of bamboo. That’s what this mattress tries to bring on the table. 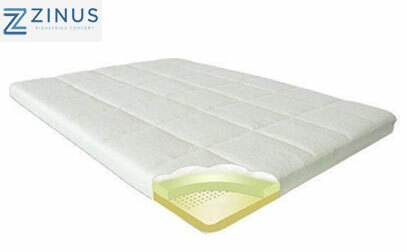 Made out of bamboo and Talalay latex, the product promises to bring a total of 33% more pressure relief than the natural fiber cushioning and conventional foam materials out on the market. If you are experiencing hip pain while trying to sleep, this might be the topper you have been looking for. Additionally, the latex is a hypoallergenic solution which is flawless and safe for usage by allergy sufferers. The product is not going to sag, flatten or bunch and it’s perfect for covering different types of beds. It’s made in the USA, and it provides a definitive luxurious appeal and natural resilience which are characteristic of the high-end price point mattresses which cost tenfold the price of this topper. 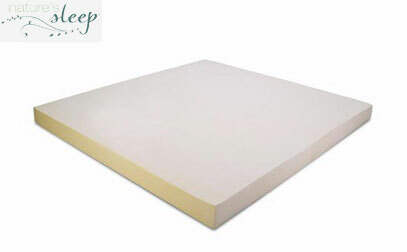 Memory foam is undoubtedly the most widely distributed and well-known material which is used for the creation of high-end bed pads. This is due to its convenient and substantially comforting properties. The material is used by astronauts to significantly enhance their ability to withstand the serious G-forces during their missions. The material is great for both hip and shoulder pain since it will conveniently snuggle around the contours of your body, offering a perfect fit for any body type. Some people would complain that this contouring brings them an unpleasant trapped feeling. However, this is no longer the case because the most contemporary technology has already taken care of it. Of course, it’s important to note that an entire bed is a better option in comparison to just a pad, but if you don’t feel like spending a small fortune, the latter will do the job. Pillow top mattress pads are also a very convenient choice. They are stitched comprehensively, bringing a distinctively differentiated construction than its counterparts and a specific level of support. This is great for people who prefer the free faller sleeping position as it would provide you with the necessary comfort. It’s capable of isolating the aching body parts and providing them with additional, selective support. This is thanks to the seams. All in all, this is a great choice for a range of different issues and not just for hip pain. Latex is another common material that you might take advantage of. It offers exceptional support for people who are suffering from hip pain. They could be easily purchased in synthetic, natural or blended latex and you can choose between a firm and a soft support depending on the body area that you want to emphasize on. Side sleepers are definitely going to appreciate the substantial pressure relief as well as the overall ability to improve the circulation. An added “green” benefit is that natural latex is sourced from a renewable resource and rubber trees which are allowed to grow further. Latex brings a springy-support without the risk of the innerspring component to peak through the layer. It’s a great solution for those of you who are troubled by hip pain. Of course, with the advancement of technology, you should be aware that there is a myriad of options when it comes to the materials that the pad is made out of. There is a range of synthetic options that you can choose from but we personally suggest taking a look at bamboo mattress pads. The main thing that they are characterized with is the added comfort and sleeping sensation they are capable of inducing. 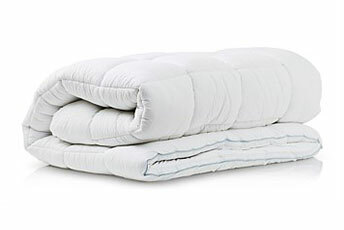 They are incredibly soft and would truly make you feel like sleeping on a cloud. At the same time, if your bed is too firm, the bamboo mattress pad will enhance its comfort, which could easily be the thing you’re looking for helping with your hip pain. What is the main cause of hip pain? There are quite a few different things that could lead to hip pain throughout the night. With this said, pinning the reason for the ache is usually dependent on being able to tell where the unpleasant feeling occurs and how often throughout the night it tends to happen. There are a few different conditions to account for. The characteristic sciatic nerve travels throughout your entire spine. It could easily become irritated because of an injury or to an improper sleeping position. This particular irritation could easily cause a lot of ache in your hip throughout the night. The posture that you lay in will play a significant role in the overall occurrence of this particular sciatic hip pain. A proper mattress pad could easily dampen the pain and enhance your sleeping position. Hip bursitis is usually a condition which stems from the inflammation of your bursa. This is located between the hip bone as well as the soft tissue which connects it to your pelvis. This is a pain which is definitive and expressed and it’s characterized by a sharp discomfort which will spread gradually through the neighboring regions. Osteoarthritis and rheumatoid are the most frequent offenders of the different flavors of hip arthritis pain that you ought to account for. You can tell that this is the case if you manage to note swelling or redness or if you’re feeling stiffness throughout your hip join. The pain will commonly follow you throughout the entire day. Improper sleeping position or a lousy mattress could easily cause this type of discomfort, called arthritic hip pain. What causes shoulder pain while sleeping? Shoulder pain is commonly caused by an issue with your rotator cuff. This is pretty much a group of tendons as well as muscles which are going to affix to the bones of your shoulder, enabling it to stay in a fixed position while moving freely and properly. This is usually experienced sharply throughout the night while you sleep but it will likely remain with you throughout the entire day. Joint pain, as well as sore shoulders, are commonly experienced if you fail to sleep on an appropriate mattress. In fact, an uncomfortable mattress could easily cause radiating pain throughout the entire area. What's the best sleeping position to relieve hip pain? Even though your hips and shoulders are quite distinct parts of your body, it's quite common that the awkward sleeping position (learn about the best ones) and improper mattress could easily aggravate them and cause acute pain. Bad posture puts constant stress on the parts mentioned above which could easily cause chronic pain. What is more, side sleepers complain a lot more of the hip as well as of shoulder pain. This is mainly because your bone structure is unable to maintain significant and proper alignment in this particular posture. This is what's going to result in the undue stress on these specific pressure points. However, as surprisingly as it may sound, changing your sleeping position could be a lot more challenging than it looks. A back sleeper will benefit from evenly distributed pressure throughout the entire body which is quite beneficial. Keep in mind, though, that thanks to advanced technology in mattress pad creation you can rely on solutions which would help you achieve proper alignment and to alleviate the pressure, regardless of your sleeping position. Should I Choose A Firm Or Soft Bed Topper? This is an important question which is pretty much dependent on the type of mattress that you have. A softer mattress is usually going to provide with a larger dip and, as such, it would need a tougher and firmer bed pad to compensate. On the other hand, if your mattress is too firm, it might put additional pressure on your lower back, hence enhance the chances of radiating hip pain as well. This is where you’d want to purchase a softer bed pad. Read more: Toppers specific to back pain. Of course, your personal preference shouldn’t be disregarded but you should most definitely account for the important characteristics mentioned above. Do I Need a New Mattress for My Hip Pain? Possibly! A new mattress, if chosen correctly, can go long way towards better cradling your pain points so you do not experience any excess pressure and holding your back in a neutral alignment so you don’t feel stress on your joints come morning. If you sleep on your side, your hip may have to bear the burden of your body weight over a narrower area, increasing pressure and increasing the likelihood of additional pain or aggravation. A plusher mattress that allows your weight to sink while foams conform to your curves while a support unit keeps your back in line may be more ideal than what you’re sleeping on right now. 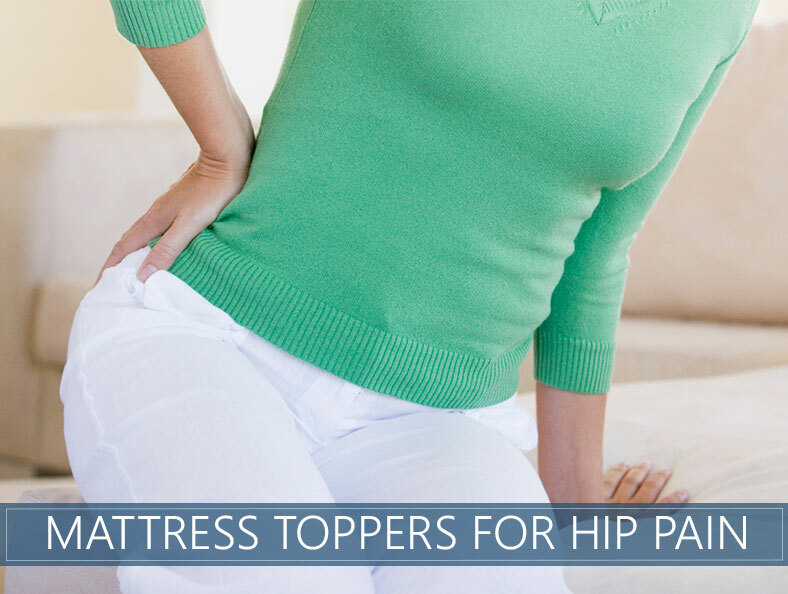 It’s quite obvious that purchasing a bed topper for hip pain could enable you to handle this particular issue. The important thing here is to take a timely reaction and to make sure that you get the necessary solution as quickly as you can. Delaying this will result in additional discomfort and substantial complications. We hope that the information that you went through will spare you a substantial amount of time. The bed pads we’ve described are particularly convenient, and they are regarded as some of the best on the market. Of course, there are other options which are readily available for you to take advantage of. Make sure to consider the specifications we've gone through, and you will surely make the right call. 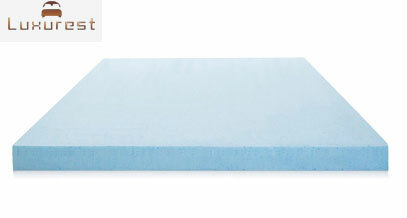 I just bought a memory foam mattress set and I’m having more pain than I did with my pillow top mattress set, do you have any suggestions as to what types of mattress topper that would help with my back, hip and shoulder pain. I’m 60 years young, I weigh 12- lbs. and I’m 5’4″ . Hi Teri. So sorry to hear about your struggles finding a good fit for your sleep! Since you are smaller than average and require extra pressure relief, I would lean towards toppers that are on the softer end of the spectrum so that your weight can settle into it. I hope this helps, and thanks for reaching out!